The Geochemical Society (GS) and European Association of Geochemistry (EAG) elect Erik Hauri, a staff scientist at DTM, as a fellow. This honorary title is given to an outstanding scientist who made a major contribution to the field of geochemistry. Hauri’s promotion to fellow is in recognition of his many important contributions to our understanding of the geochemistry and geochemical processes operating on Earth and the Moon. Hauri received his Ph.D. in geochemistry from MIT in 1992. He is a member of the geochemistry & cosmochemistry group at DTM, where he works with DTM colleagues, postdocs and graduate students of collaborators to examine the processes associated with planetary origins and evolution, mantle convection, and the volcanic expression of chemical variability inside the Earth and the Moon. 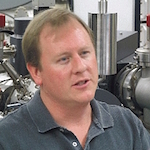 Many of his projects involve field work to collect samples, all of which involve state-of-the-art measurements in mass spectrometry.